scheduling issues, but as it is the last encounter and the players are well aware of this fact, I will do a post-mortem just a bit early. Issues like game balance, plot challenges and the game’s theme are my focus today. 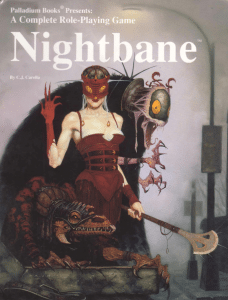 Nightbane is a Palladium offering and Palladium rightly deserves criticism for one of the least balanced RPG systems in all of creation. I knew that going in and felt confident that a few house rules would fix any glaring issues. That said, a couple of balance issues appeared that were beyond any sense of reason or propriety. Jaw-dropping is a fair adjective. Power needs an offset, some cost either mechanical (e.g. 1/per day usage) or role-playing ( I need to sacrifice a kitten to make my megaweapon work). The “Speed of the Darkling” Nightbane talent is so poorly thought out that it demands ridicule. First, it grants an auto-dodge which is a huge benefit alone, but then goes on to multiply the PCs speed…a lot. A couple of players took it after scoring wings in character generation and they literally out ran helicopters! My first two game sessions degenerated in to hit and run encounters. Why fight when you can simply grab up the non-flying PCs and bolt for the hills? It does have a drawback, after you use it for a minute you take a fatigue hit and some minor penalties. One minute (4 combat rounds) is the Palladium combat equivalent of six months, so it really never mattered. A LOT happens in a single combat round. I quickly banned it and moved on, but it was a head-slapper. What the hell was the author thinking? One other thing I will ban in future is a Morphus feature that grants a holy weapon as part of your body. Nightbane automatically bypass a lot of enemy defenses by their very nature, so the “Holy” damage never came in to play that much. Then I started using critters from the rest of the Palladium Rifts universe. Big mistake. Many Rift’s bad guys have damage multipliers versus holy weapons. Combined with the Nightbane’s hitting power and a few of my bad guys went down like tissue paper targets. Specifically, a formidable “Reacher from the Deep” from Rifts: Underseas was destroyed in two rounds with really no risk to the party. One player nearly took it out single-handedly because his weapon did 10x damage every hit! Do not strip everything out, but keep these egregious examples from your game table. Save yourself the headache as the players run about in your sandbox. Running a pure sandbox campaign where the players do whatever they like is great, but there is a trade-off. Pure sandbox games always feel like a bad season of the TV show “Lost.” You get the feeling that the writers pulled every plot thread trying to keep the over-complicated beast of a plot running, weaving a ragged tapestry of weak plot points. It feels desperate. A pure railroad, linear campaign is not the answer either. The players bore quickly when choice disappears. Nightbane is a modern horror game, so I took a page from the “X-Files” plot guide. There were two kinds of X-Files episodes, mythology and monster of the week. Mythology episodes directly discussed the alien abduction/invasion plot. Monster of the week was pure protagonists versus a one-off monster. Rather than making it a session level decision, I broke it up by encounter. PCs saving innocents from a gruesome death in a warehouse feeding area for demons is pure Monster of the Week, fun but it does not advance the underlying plot. Killing the evil mayor and stealing his laptop full of secrets to hack later is pure mythology. Which leads me to the saddest point of this post. Nightbane’s theme is one of discovery of a world beyond the normal, where magic exists and the world is at war with extra dimensional powers beyond imagination. It is a vast and intimidating discovery sure to rend the soul for those that uncover the mystery. Sadly, this is the problem because Nightbane only works once. It is like the movie “The Usual Suspect.” Once you know who Keyser Soze is the movie loses much of its power. Sure, Nightbane works as an urban superhero game but that is a pale game compared to the first campaign of discovery. Still, one great campaign filled with horrify revelation and even more horrifying enemies is well worth playing. So, anyone out there want to take up the sword and bring swift justice to the enemies of humanity? Thx for letting us know. I found your blog entry while surfing for input for my coming Nightbane campagin. I just got the books via ebay and I am hooked. I love the setting. So to get some knowledge what does not work within it’s rules is quite appreciated.